Last week about 20 rabbis from the Los Angeles area participated in a High Holiday sermon writing workshop called "Punching Up Your Holiday Sermons." These pre-Rosh Hashanah sermon workshops for rabbis are nothing new, but this workshop had a twist. It paired the rabbis with Hollywood screenwriters who helped them come up with more engaging sermons. It's possible, however, that Rev. Al Sharpton has been more helpful to rabbis writing their High Holiday sermons this year than these talented screenwriters. His recent mea culpa may be the subject of many sermons heard in synagogues this High Holiday season. Rev. Al has been in the news a lot lately. Just the other day it was announced that he will be hosting his own show on MSNBC to be called "PoliticsNation," which will debut on August 29. Sharpton will become the network's only African-American host. This is good news for Sharpton, who made headlines recently when he wrote an apologetic Op-Ed piece in the NY Daily News in which he admitted to making mistakes during the racially fueled Crown Heights riots 20 years ago. Sharpton has long been blamed for inflaming tensions between Blacks and Jews in the Crown Heights neighborhood of Brooklyn in 1991. It all began when a car in the late Lubavitcher Rebbe's motorcade struck and killed an African American boy. Many argue that Sharpton incited the angry crowd leading to the fatal stabbing during the riots of Jewish student Yankel Rosenbaum. In his apology Sharpton wrote, "Twenty years after the Crown Heights riots, the city has grown, and I believe I have grown. I'd like to share a few of my reflections about the choices I made, including the mistakes, with an eye toward advancing racial understanding and harmony." I would have shared a story about what happened when, as a young man, I was brought to the Jewish Theological Seminary by one of the civil rights leaders who had been an aide to Dr. King. That day, I was introduced to Rabbi Abraham Joshua Heschel. Rabbi Heschel had marched with Dr. King in Selma in support of the Voting Rights Act. For doing so, Heschel was attacked by some in his community who were very conservative and thought a theologian should stay in his proper place. He gave me a book and autographed it and, as we talked, I asked him about Dr. King -- the man and the hero. That's when Dr. Heschel said to me: "Young man, only big men can achieve big things. Small men cannot fulfill big missions. Dr. King was a big man." Crown Heights showed how some of us, in our smallness, can divide. We must seek to be big. Next weekend, we will unveil the monument to Martin Luther King in Washington. I will speak at the ceremony along with members of the King family and the President of the United States. I will continue to think about the value of the lives of Gavin Cato and Yankel Rosenbaum as I look up at the big statue of Dr. King. I will look towards the heavens and I will wink at Rabbi Heschel. Not everyone seems to be ready to move on even if it has been twenty years since the Crown Heights riots. Last week, Sharpton was forced to back out from a scheduled panel discussion on the riots at the Hampton Synagogue after the synagogue's rabbi, Marc Schneier, came under fire for the event by Yankel Rosenbaum's family among others. I think we should take Sharpton at his word. A cynic might say that he believed he needed to apologize for his role in the riots in order to get his show on MSNBC. However, after reading his apology I feel it is sincere. Many apologies by celebrities these days take place before the guilty individual has really had an opportunity to think about their mistakes, not to mention most of those apologies have been written by publicists. 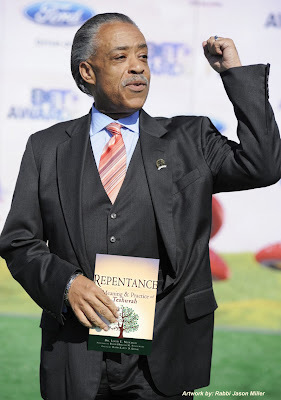 Sharpton had twenty long years to consider what he did and appeared contrite in his published apology. What Sharpton did is what we call "teshuvah" (repentance) in Judaism and it is precisely what is called for before and during the High Holidays. Sharpton's apology will be a fitting example for rabbis to share with their congregations on Rosh Hashanah and Yom Kippur. Rev. Al Sharpton restated what he did in the situation and then explained why it was misguided and why he won't do it again. I'm sure twenty years ago Sharpton never thought he'd ever be able to apologize for his actions during the Crown Heights riots, but he just might become an example to the Jewish community for doing teshuvah. The two unnecessary deaths in 1991 must be remembered and mourned, but the time has come for the Black and Jewish communities to move on from the Crown Heights riots. Black-Jewish relations have certainly improved in the two decades since Crown Heights. A recent video on the Funny or Die website demonstrates just how much commonality exists between Blacks and Jews. In fact, two of the artists mentioned in the song (the Jewish performer Drake and the Jewish biracial artist Lenny Kravitz) have collaborated on a new track called "Sunflower" for Kravitz's upcoming album "Black and White in America." 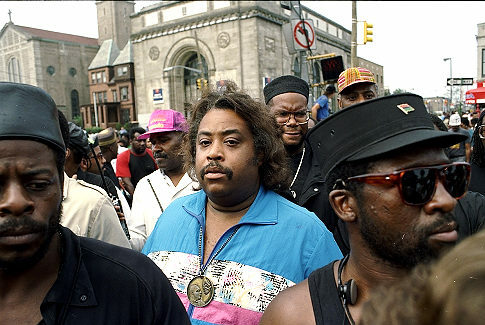 Maybe Sharpton will have Drake and Lenny Kravitz perform on his new MSNBC show. Our wise old rabbiS, HAZAL-Hebrew acronym of : our wise-men of blessed memory, tel us: modeh v'ozev- yeruham- he who admits his guilt and repents, should be forgiven. I have two words for you on the subject of Al Sharpton and t'shuvah: Twana Brawley. Sharpton does whatever he does to further is own aims. He's a liar and a user. He destroyed multiple lives in Poughkeepsie and has never apologized nor shown any remorse whatsoever. He is a racist. And when it suits his needs to be an anti-semite, he will be one, too. Do not hold him up as an example of anything except self-serving egotism. Wifey Person, It's "Tawana". Perhaps I should have been clear in my post that I was only focusing on Sharpton's behavior during the Crown Heights pogroms. He's had a long live with many ups and downs -- successes and mistakes. Is it possible there was a quid pro quo for his remorse on the 20th anniversary of Crown Heights? Of course. But hopefully he really is apologetic and will move on.